Nobu Residences Toronto will be dedicated to distinguished luxury, incorporating historical facades from the Pilkington Glass Factory. The fashionable lifestyle residences will feature 700 condominium suites in two dramatic 49-storey towers and a podium complete with indoor and outdoor amenities including ground floor commercial retail, flexible private social function and meeting space, a state-of-the-art fitness centre and ‘Zen Garden’ outdoor terrace. Founded by Chef Nobu Matsuhisa, and Academy Award winner Robert De Niro, Nobu is one of the world`s most celebrated luxury hospitality brands. 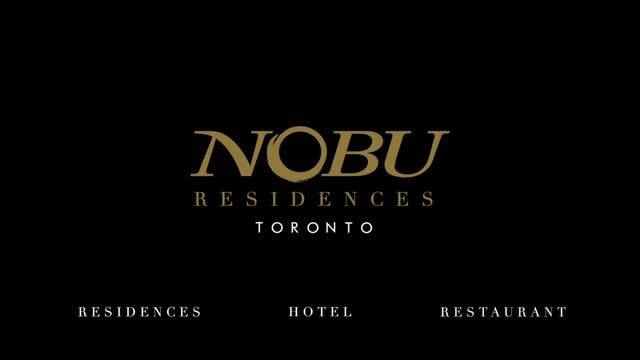 The Nobu Hotel Toronto will offer the ultimate in hotel luxury. Sitting as a cornerstone of the Nobu Hotel, Nobu Restaurant Toronto will feature a two-level restaurant which will include a signature bar lounge, outdoor seating and chic private dining rooms. Named one of luxury's 25 Most Innovative Brands by Robb Report, Nobu Hospitality is ranked among an elite selection of global luxury brands. The natural growth of Nobu hospitality built on service, image, and reputation, offers the complete spectrum of hotel and restaurant management for unique projects around the world. Founded by Nobu Matsuhisa, Robert De Niro and Meir Teper, with operations spanning five continents, the Nobu brand thrives in the world's capitals as the ultimate destination lifestyle experience. The first Nobu Hotel opened in 2013 as a boutique hotel within Caesars Palace Las Vegas and was subsequently named one of the Hottest New Hotels by CNN Travel, Top North America Hotel Opening by Luxury Travel Advisor and subsequently Luxury Travel Advisor's Award of Excellence. The Nobu Hotel City of Dreams Manila opened in 2014 and Nobu Hotel Miami Beach in 2016 and will be followed by Nobu Hotels in London, Malibu, Riyadh, Los Cabos, Chicago, Bahrain and Toronto. Nobu is strategically focused on further expanding its global portfolio of hotels through a solid development pipeline. For 55 years, Toronto-based Madison Group is a widely diversified real estate development company with extensive experience in creating master planned communities, award winning high-rise and low-rise residential projects, and a substantial portfolio of office and commercial properties in Toronto and New York City. Madison Group is defined by the talent, dedication and passion of its team; focused on setting the standard for value, design and customer satisfaction. Madison Group has evolved from a successful family business into a multi-faceted company that services every aspect of the building and land development industry in Canada and the United States. While we have grown and changed with the times, our commitment to family values, uncompromising quality, integrity and innovation continues to set us apart. Madison Group has charted an amazing success story on both the Toronto and New York skylines. With high rise residences like the award winning condominium, The Madison, in the heart of midtown Toronto, and The Icon in New York City's Hell's Kitchen, we pride ourselves in offering the perfect balance of location, amenities and lifestyle. We have built thousands of homes in Ontario in premier locations throughout the Greater Toronto Area. Our reputation for unique designs, attention to detail, outstanding quality, value and customer service, has earned us many coveted industry awards as well as the trust and loyalty of our homeowners. Madison Properties and its affiliated companies have been successfully developing and managing commercial real estate for over 55 years. We currently own and manage over 2 million square feet of commercial property, including office, retail and industrial buildings in the Greater Toronto Area. We consistently deliver excellent tenant services and we strive to improve our buildings and properties to better serve our valued tenants and the surrounding communities. One of the advantages of Madison Group is our ability to develop our land for low-rise and infill residential projects. We undertake the planning, approvals, in-ground, street servicing and all of the pre-construction stages that ultimately lead to the successful awarding of the building permit. With an extraordinary selection of standard and upgrade finishing choices, ranging from flooring tiles, carpeting, and hardwood, to plumbing fixtures, frameless glass showers, rain-heads, to extensive kitchen cabinets and backsplashes, the Madison Homes Design Studio is the place where you’ll make your new home your own. Madison Group’s newest division reflects our innovative and collaborative approach to unique market opportunities. When the dust settles, Madison Group will be the owners of the trendsetting NOBU Toronto – a fabulous condominium residence, exclusive boutique hotel and world-renown restaurant. UPark is a forward-thinking parking company on a mission to change the way Toronto parks. You drive in and you drive out. Our intuitive parking technology is fast and easy to use. You can pay at the lot or with your smart phone. You can even extend your parking with a text message. Headquartered in Manhattan, our USA division – Kinsmen Property Group, owns and manages strategic residential holdings in New York City. Madison Group has also been involved in the acquisition and development of land parcels throughout Florida. The Madison Group is in partnership with VIVA Communities and together we are changing the face of retirement living in Canada. We believe that our retirement communities are more than just bricks and mortar. We are building places that are giving people a second chance at life… a place to live, love and laugh! Madison Capital is a division of the Madison Group. Our unique knowledge of the GTA and of land, acquisition and development enables us to provide corporate financing and services for third party projects. For over 60 years, Westdale Properties has managed residential and commercial properties (including retail and industrial) in Ontario, Quebec, Nova Scotia and Saskatchewan. At the present time, we own and/or manage over 6,000 residential units. In addition, we own and/or manage more than 2.7 million square feet of commercial properties. Westdale Properties is also presently developing three residential condominium projects in Toronto. From its inception in 1989, Teeple Architects has built a reputation for innovative design and exceptional service through a broad range of acclaimed public and private-sector projects. 100/100 Daily errands do not require a car. LANDSCAPE DESIGNER: Ferris + Associates Inc.